It is and outdoor dinner theater and working cattle ranch. They serve a chuck wagon dinner, served outdoors under the stars. Only in the west, right? Along with your barb bq and beans, you get live cowboy music. This is truly an adventure. Of course being six at the time, anything was adventurous, including going out with the Grandparents, or maybe especially going out with the Grandparents. Back then they served the meal on tin trays, and we sat at picnic tables with a napkin tucked under your chin, and listened to some real Western music. I remember the trays were hot, but the food was tasty. Flying W is still there, and it is still a working ranch with the dinner shows. These days you can find them on the web at http://www.flyingw.com/. 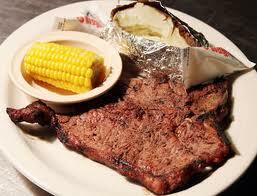 Anyway here is a Cowboy Steak you can make at home. This is from the Cooking Club of America. They are so good. I just have to share. These tiny parfaits pack a lemony burst of flavor in every creamy serving. Your guests will love the presentation, but as an alternative, you also could assemble the parfaits in larger, more traditional serving dishes. 1. Beat cream cheese, sweetened condensed milk, lemon juice, lemon peel and vanilla in large bowl at medium speed 30 to 60 seconds or until smooth. Beat in whipping cream at medium-high speed 2 minutes or until thickened. Fold in sour cream. 2. Microwave lemon curd in small microwave-safe bowl 5 to 15 seconds or just until slightly pourable. Spoon about 2 teaspoons cookie crumbs into each of 12 (1 1/2- to 2-oz.) shot glasses. 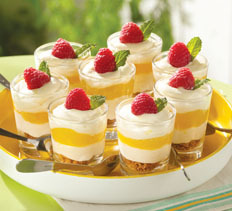 Layer each with about 2 tablespoons cream cheese mixture, 1 teaspoon lemon curd and 2 tablespoons cream cheese mixture. * Cover and refrigerate overnight. Garnish with berries and mint leaves. Back in 1930, Kenneth and Ruth Wakefield purchased a Cape Cod-style toll house located halfway between Boston and New Bedford, on the outskirts of Whitman, Massachusetts. Originally constructed in 1709, the house served as a haven for road-weary travelers.. Here, passengers paid tolls, changed horses, and ate much-welcomed home-cooked meals. It was also here, over 200 years later, that the Wakefield decided to open a lodge, calling it the Toll House Inn. In keeping with the tradition of creating delicious homemade meals, Ruth baked for guests who stayed at the Toll House Inn. As she improved upon traditional Colonial recipes, Ruth's incredible desserts began attracting people from all over New England. 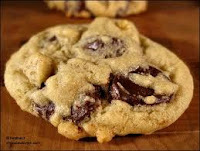 One day, while preparing a batch of Butter Drop Do cookies, a favorite recipe dating back to Colonial days, Ruth cut a bar of our Nestlé Semi-Sweet Chocolate into tiny bits and added them to her dough, expecting them to melt. 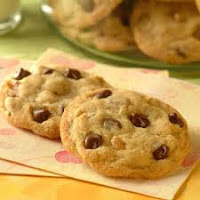 Instead, the chocolate held its shape and softened to a delicately creamy texture. The resulting creation became very popular at the Inn. Soon, Ruth's recipe was published in a Boston newspaper, as well as other papers in the New England area. Regional sales of Nestlé Semi-Sweet Chocolate Bar skyrocketed. In another bowl mix flour, salt and soda. add the flour mixture to the egg mixture a little at a time. After dough is well mixed and chips and nuts. bake at 375 for 10 minutes or until golden brown. Well, most of us are melting right now. The summer heat is hear. That doesn't mean we still can't be creative and fun. 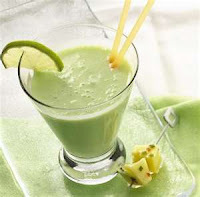 So here are some sweet, fruity, creamy drinks to keep you cool and energized. chop the vegetables and place in a blender with the ice. if it gets too thick, add just a splash of vegetable broth. 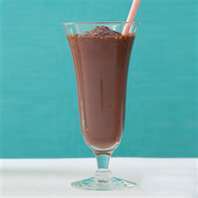 Put coffee ice cream , milk and frozen cherries in the blender, blend until smooth. Top with whipped cream and cherries. I love chocolate haystatcks. What are haystatcks. it's chocoate and toasted coconut. This is so simple. 1. Prepare a baking sheet by lining it with aluminum foil. Preheat the oven to 325 degrees. 2. Place the coconut in a pie tin or small baking pan, and toast it in the oven until golden brown. The secret to good toasted coconut is consistent browning, so be sure to stir it every 2 minutes until it is an even, light golden color. It will probably take 8-10 minutes, but monitor your coconut carefully. 3. While the coconut is toasting, place the chocolate in a large microwave-safe bowl. Microwave it until it is melted, stirring every 45 seconds. 4. Once coconut is toasted and chocolate is melted, stir the coconut into the chocolate, mixing until coconut is entirely coated with chocolate. 5. Using a small teaspoon, drop small spoonfuls of the candy onto the prepared sheet. • ½ pound ground breakfast sausage. 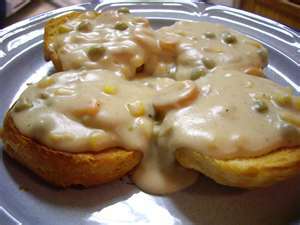 Cut the biscuits in half, pour the gravy over them. If you are of a certian age, you'll rember getting to make these with our folks. It's a fun project to do with the kids. Looke groovy too, when you cut the cake. Prepare cake in two layers and cool 15 minutes. Poke with fork at 1/2" intervals. Do not remove from pans. 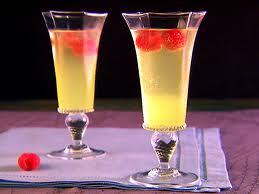 Dissolve each package of Jello separately in 1 cup boiling water. Pour each cup over a different layer. Chill 4 hours. Frost. 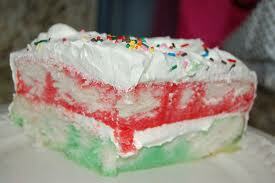 Top with colored sprinkles if desired. One of my favorite cookbooks is Better Homes and Gardens. It has some wonderful easy to follow recipes in all categories. My favorite category is slow cooking. It’s so nice to put things in the crock pot and then have dinner when you get home. Well, I found some sandwich recipes for the crock pot on their website. Enjoy. *Do not substitute with diet root beer. 1. Trim fat from meat. If necessary, cut roast to fit into a 3-1/2- to 5-quart crockery cooker. Sprinkle meat with the salt and pepper. In a large skillet brown meat on all sides in hot oil. Drain off fat. Transfer meat to cooker. Add onions, the 1 cup root beer, and garlic. 3. Meanwhile, for sauce, in a medium saucepan combine the 3 cups of root beer and the chili sauce. Bring to boiling; reduce heat. Boil gently, uncovered, stirring occasionally, about 30 minutes or until mixture is reduced to 2 cups. Add root beer concentrate and bottled hot pepper sauce, if desired. 4. Transfer roast to a cutting board or serving platter. Using a slotted spoon, remove onions from cooking juices and place on serving platter. Discard juices. Using 2 forks, pull meat apart into shreds. To serve, line buns with lettuce leaves and tomato slices, if desired. Add meat and onions; spoon on sauce. Makes 8 to 10 servings. 1. In a large saucepan, cook onion in hot oil over medium heat about 4 minutes or until tender. Add shredded beef, undrained tomatoes, cumin, and chili powder. Bring to boiling; reduce heat. Simmer, uncovered, about 5 minutes or until heated through and desired consistency. Stir in cilantro. 2. To serve, sprinkle some of the cheese over bottoms of onion rolls. Spoon about 1/2 cup meat mixture over cheese on each bun. Sprinkle with remaining cheese and the shredded lettuce. Add roll tops. Makes 4 servings. Trim fat from a 3 to 3-1/2 pound boneless beef chuck pot roast. If necessary, cut beef to fit a 4- to 5-quart slow cooker. Place 2 large onions, cut into thin wedges and 2 cloves garlic, minced in the cooker. Top with beef. In a medium bowl, combine 1, 14-ounce can beef broth, 1 tablespoon Worcestershire sauce, 2 teaspoons dry mustard, 1 teaspoon dried thyme, crushed; 1/2 teaspoon salt, and 1/4 teaspoon cayenne pepper. Pour over beef in cooker. Cover and cook on low-heat setting for 11 to 12 hours or on high-heat setting for 5-1/2 to 6 hours. Remove beef and onion from cooker, reserving juices. Using two forks, shred beef, discarding any fat. 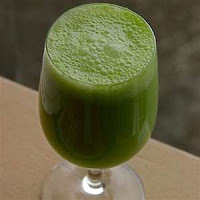 Skim fat from juices. Add onion to beef; add enough juices to beef to moisten. Place 2-cup portions of beef in airtight containers and refrigerate for up to 3 days or freeze for up to 3 months. Makes 6 cups. Let’s face it, it’s summer and it’s hot. We all know we need to replace our fluids. Drinking soda and a lot of caffeinated drinks will just dehydrate you more. So, that pretty much leaves water. OK, plain water can be boring, but we need to replenish our fluids on these hot summer days. Here is how you can make your water fun to drink, add some fruits or veggies. Mixes include. Lemons and raspberries, or cucumbers and rosemary, or lemons and limes, or strawberries and mango, oranges and pineapples, or melons, and even mint… have fun with it. You might even get a few vitamins out of it. Start with ½ a gallon of cold filtered water and a hand full of your favorite combo, add ice and refrigerate at least an hour. What to do with the fruit left in the bottom. Peel in blend it and pour into a pop cycle tray, and freeze. Yummy and refreshing. I thought I’d do some investigations, and look for my birthday cake. My Granny and I had birthdays one day apart, so when we were together I used to beg her to make this cake. I don’t know if this is the exact cake, but it was called the $100 cake. I remember the cake was super moist, rich and dense. A person just needed a small slice to be satisfied. The story went back in the roaring 20's a man eating at the Waldorf Astoria enjoyed this cake so much he asked for the recipe, well the cook gave him the recipe, and he was thrilled. When he got a bill for $100 and that is why it’s called the $100 cake. This may be close, Mom? Cream butter and sugar. Add melted chocolate and eggs. Sift dry ingredients together and add alternately with milk. Add vanilla and nuts. Put batter in layer pans (greased and floured) and bake at 350 degrees for 25 to 30 minutes. Top with $100 Waldorf Chocolate Frosting. Beat egg and add lemon juice. Add butter, chocolate and vanilla. Add sugar gradually, beating all the while. If frosting is too thick, add hot strong coffee or cream, as much as is needed to make frosting thin enough to spread. This is a fascinating read. Full of unconventional things you can do to lose the extra weight. There are other subjects in the book, but lets talk about the rapid weight loss. Some of the tips include ice baths, doing squats after eating a big meal, and letting yourself binge once a week, and eating a high protein breakfast. Getting cold: In a way this makes since. When you’re cold, you burn more calories. Look at the nature shows where the scientists are exploring the arctic. They always take about bringing extra food. Exercise, hiking when you’re really cold, burns more, there fore in order for them to maintain they need to eat more. So the logic says if you want to loose, get cold. Start slowly. Don’t shock you’re system. Put ice packs on your neck and head. Then move to cooler and cooler showers, and then go for the ice bath. Eating a high protein breakfast: The book recommends eating 30 grams of protein 30 minutes after waking. Sounds like a lot. That’s the equivalent of 5 eggs. There are ways of getting that protein with out the added calories. One way is a protein smoothie. Just add a good quality protein powder. Ah the Hot steamy days of July, and anyone with any sense does not want to cook. So let's do salad for supper. you can get all the ingredients from the super market pre-washed and cooked. so prep time is fast. combine all the ingredients. chill for 1/2 an hour and then top with dressing right before serving. In a medium bowl, stir together the chicken, cherry tomatoes, scallions and sour cream dip. Season with salt and pepper. Arrange avocado slices on four salad plates. Spoon chicken salad over avocado and serve. The horseradish gives it a kick and the avocados make it creamy. Yesterday, I had an “ah-ha” moment. After doing some reading and listening to my hypno session. I occurred to me… I am in control. I am in charge of my eating. I felt suddenly free from the worrying and planning and the second guessing myself whether I was hungry or going to be hungry in the future. In that moment, I felt lighter, and happy. The first time I tried to do conscious eating, I got a copy of 7 secrets of thin people. I was always worried and second guessing myself, and wasn’t happy. I constantly had to ask myself “how do I feel?” Maybe I wasn’t serious enough to make the change. A few years later I tried again. I got a copy of “Diets Don’t Work” and slowly started going through the exercise. Yes it was uncomfortable to go through all those exercises, and I worked for a while, but then went back to second guessing and worrying. See one problem really over weight people have: We can’t stop thinking about food, whether we are hungry or not. So we trick ourselves into eating when we don’t have to. In today’s world we are always looking at advertisements for food, on TV, the internet, billboards, the side of buses…etc. Anyway back to my current book. Why is this one different? Yes they all say eat when your physically hunger stop when you’re full. Why is I can Make you thin so different? I think it’s the hypnosis and the self hypnosis he teaches in the book. Yes there are exercises to check in with you, but there are techniques to get through the tough times—there aren’t charts and graphs and loads of questions to answer and analyze. Anyway yesterday was a breeze, and the spaghetti was delicious, and I just ate one bowl. Let's have spaghetti for diner. This recipe is easy, because you get to use your crock pot. Everyone loves spaghetti-- kids from 2 to 92. 1lb of ground meat. at least 80% lean. chop the celery, pepper onion mushrooms and onion and tomato. Set them aside. In a large skillet brown the ground meat. at the seasonings, salt, pepper and vinegar. Turn on the crock pot to warm. add the jarred sauce the can of tomatoes and the ground meat. add the onions, peppers, mushrooms garlic and tomato to the skillet you browned the meat in at a little salt. slowly cook until the the vegetables are translucent but still have a little crunch. add them to the crock pot. simmer for 4 hours. Sit back relax. this recipe has many servings so freeze some of the sauce or take it to a party. Lets face it dieting is ridiculous. Who really weighs and measures each bite of food they stuff into their mouths? OK a few—for the rest of us we’ll do it for a while, but, then we start guessing. 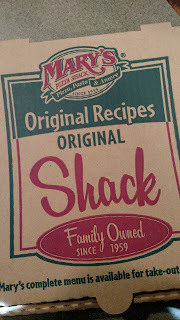 Then after a few weeks we’re back to our old eating habits. I have been on so many diets. Low carb, low fat, no fat, no white sugar/flour diets. I’ve tried giving up bread, milk, and processed foods. I even tried to go vegetarian once. -- All this to try to lose weight. If you really want to loose weight and keep it off, you need to make a lifestyle change. You want to do this. It’s important to your health and over all well being. There are some great mental exercises I recommend. They come from “Diets Don’t Work” by Bob Schwartz, “7 Secrets of Thin People”, and my new favorite “I can make you thin” by Paul McKenna. Paul’s Book also comes with a 25 minute hypnotherapy session. The basics that these books share, are be conscious of what you eat. Be fairly physically hungry when you eat, and enjoy the food. Then stop when you are full. If you are bored, tired, stressed, lonely do something else. Chances are you are not really hungry. If you are thirsty drink some water. This is my new journey... I will still post my favorite recipes, and reviews, but I'd also like to talk about some conscious food choices. Labels: diets don't work slim peeople recipes, food choices, thirsty. How do you feel about Brinner? How do you feel about "Brinner?". What is Brinner? Brinner is Breakfast food served at dinner time. Some folks will make cinnamon rolls, or pancakes. Carbonara was invented because American service men in Italy in WWII had to have bacon and eggs. so someone figured out how to make a pasta dish. I love a good carbonara. I sometime go a little further and add chicken too. but this is post is Brinner not pasta. Once upon a time one of my favorite cooking shows was Everyday Italian. yum. Giada did a breakfast for dinner show once, although she didn't call it Brinner. she served steak, and asparagus topped with a fried egg, Italian parsley chives and a little crumble of goat cheese. This is my take on that. 1 small fillet of beef. in a small sauce pan. add some water, bring to a boil. add trimmed asparagus and a pinch of salt. set on low to simmer. In your favorite grill pan. put on stove and get it hot. Brush it with the olive oil. add the fillet. Cook until desired doness. season to taste with a little salt and the gill seasoning. drain the asparagus. melt the butter and add the lemon juice. add back the asparagus. turn off heat and cover to keep warm. Fry the egg in the a non stick pan. On a nice dinner plate. place the steak, arrange the asparagus around it and place the egg on top. sunny side up. dress it up with parsley and chives. and viola, their you have a classy Brinner. There is a small deli in a small town in Northern California that is a staple among the locals. Among the variety of meats cheese, salads, sandwiches and the bottles of Bob's Really Good Red Wine, they also serve soup. Now according to the owner of the this local eatery, he buys the soup pre-made. All he has to do is put it in a crock pot in the morning and turn it on. He will rotate the soups depending on the day of the week and weather, but one of the standards is An Artichoke Bisque. So this afternoon I took a cruise around the Internet looking for something that sounds close to what I had at the deli, and I think this is the winner. continue to cook over medium heat until garlic is soft, about 1 minute. Sprinkle flour on onion mixture and stir constantly over medium heat for 3 minutes. Add chicken broth, water, wine, bay leaf, salt, white pepper, thyme and hot pepper sauce. Simmer, partially covered, for 45 minutes. 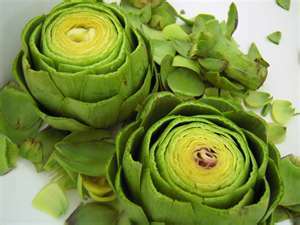 Stir in artichoke hearts with liquid and cream. Cover and simmer on low heat for an additional 30 minutes. Remove the bay leaf before serving. Let me know what you think. And if your in that little deli try the bisque.